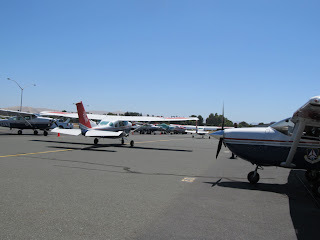 The California Wing Mission Pilot School (MPS) was an excellent weekend of flying and training. 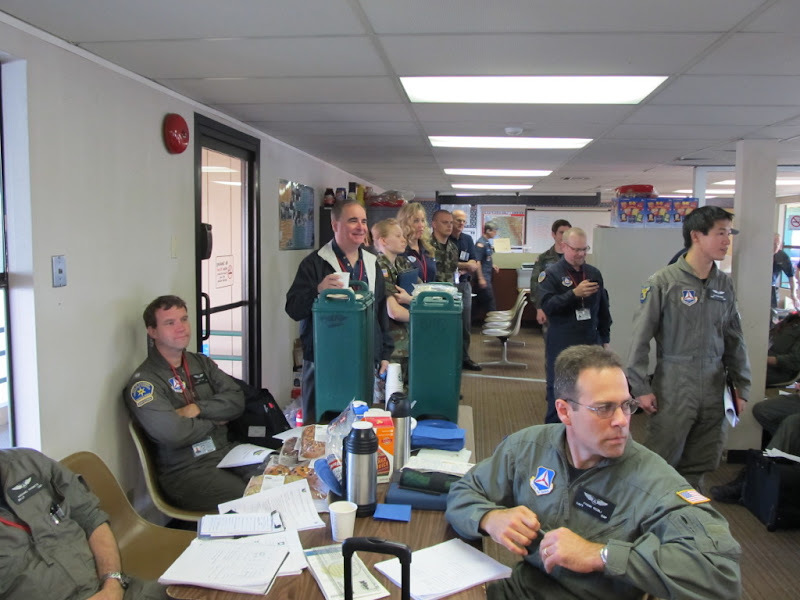 It was a chance to fly with more seasoned mentor pilots -- all of whom gave up their weekend just to sit in the right seat and teach us -- to get more exposure to a busy base operation (with 13 planes flying multiple sorties each day), and to work with ground teams. The most interesting of my four flights was the practice ELT search Sunday morning. We launched from Concord with instructions to proceed to a large area east of Mt. Diablo. As we rounded the east side of Mt. Diablo heading southeast (at 5,500 feet), we picked up the familiar oscillating tone of the practice beacon on the number two communication radio (Com 2). Though we could hear the beacon, we could not get our L-Tronics Direction Finder (DF) needle to indicate a direction. So we decided to box our assigned area and then make a decreasing square around the signal. We identified the eastern edge of our area and began flying south. As soon as we passed over Byron (C83), the signal faded. We turned back and eventually set up an orbit over Byron. We could hear the signal with Com 2 de-squelched, but the signal was not strong enough to break squelch or cause our DF needle to budge. Without DF information, we resorted to aural techniques. We turned down Com 2, turned up the DF volume, and began doing turns and wing nulls. These indicated the beacon was in the direction of Livermore, so we turned west. The sound of the beacon grew stronger as we flew over the hills, but then faded at about the edge of Livermore's airspace. Once again, we could hear it grow and fade in strength, but our DF gear was useless. So we descended to about 3,500 feet and began trying to mark out the edges of the area of greatest tone, intending to fly a decreasing square just based on sound. Once again, the signal did funny things. Several wing nulls and 720 degree turns later, listening alternately to the tone on Com 2 and L-Tronics, we narrowed the likely area down to the area around the Livermore Gun Club. We contacted the ground team and directed them to the area of greatest signal strength. But though we could hear the beacon at 3,500 feet, they could not detect it with their DF gear on the ground. It turned out that we had gotten them to within about 1/4 mile of the beacon. It had been placed inside a tree trunk (which is why the ground team couldn't detect it), and its battery had not been charged (which is why the signal was too weak to break squelch or activate our DF gear). Ed. Note: 2d Lt Perreira from SQ188 was part of the Urban Direction Finder (UDF) team that placed the Practice Beacon in the tree trunk. It was, I'm told, a realistic experience: ELTs end up buried in airplane fuselages and ping for many hours before an airplane comes looking for the signal. This makes them difficult to detect and harder to pinpoint once detected. All in all, it was excellent training and I'm grateful to have had the opportunity. 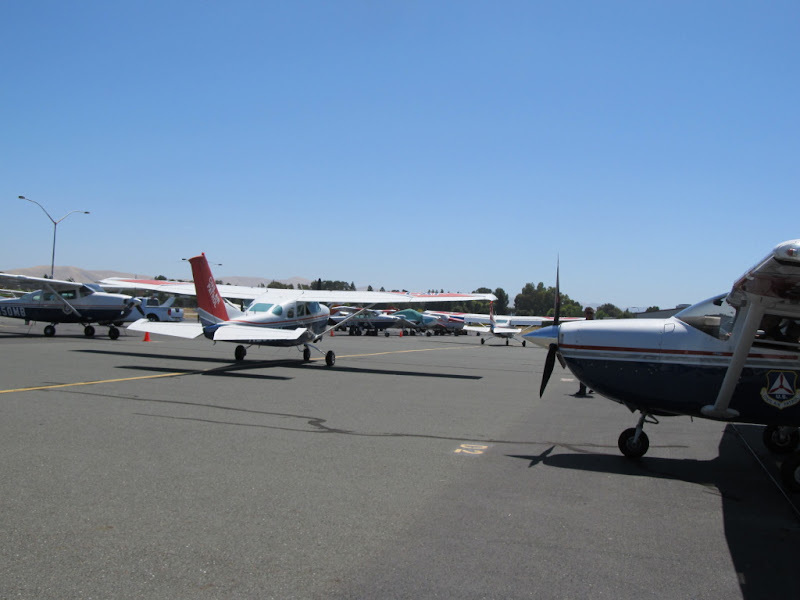 Ed.Note: The MPS is provided to California Wing Mission Pilot Trainees each summer. The course consists of two days of ground school and two full days of flying. Each Mission Pilot trainee receives four flights designed to cover the Specialty Qualification Training Requirements for Mission Pilot. The MPS website is located Here, and more pictures from the School can be found Here. Capt Frank Riebli is Squadron 188's Safety Officer and is a Mission Pilot Trainee.